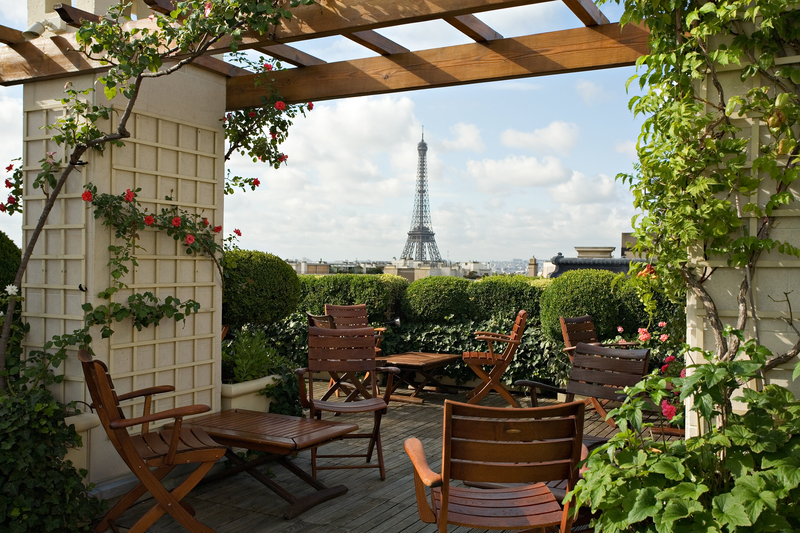 A perfect weekend in Paris for me has to include a couple of nights at the wonderful Raphael Hotel. It’s an old fashioned hotel, brilliantly located on the Avenue Kleber. When you step out of the front door you have the Arc de Triomphe in one direction and the Eiffel Tower in the other. Head down to the Seine or up to the Champs Elysees. Many of the staff at The Raphael have been there for years. In fact the Concierge has won awards for his professionalism and know-how around Paris. There is a bar on the ground floor that is a popular meeting place for locals and visitors. In the afternoon it is a ‘salon du the’, in the evening champagne corks start popping. The hotel is owned by a local French family and has been for decades. It is under-stated, traditional and above all reassuring. Wes Anderson used the hotel for his short film ‘Hotel Chevalier’ a prequel to the ‘Darjeeling Limited’. The bedrooms have beautiful floor to ceiling windows with the brass bolts that I always associate with French chateaux. Bathrooms are white marble, spacious and old-fashioned, lots of shiny chrome and fluffy white towels. Some of the rooms have views of the Eiffel Tower. Breakfast is generous and delicious, fresh fruits, pastries, eggs and bacon, cafe au lait. And the lift, the lift, it’s in a wire cage, one of those Victorian style wrought iron cages, black and shiny. There isn’t actually a lift operator, they went in the 70s. However the lift has got a seat in it – a sign of ultimate luxury as far as I am concerned. When you get out of the lift on the top floor you step onto a terrace, a magical terrace, with spectacular views over Paris. In the summer months you can have dinner or drinks here on the roof terrace. It really is quite perfect. I like to head up to Porte St Ouen and the flea market ‘Marche aux Puces’ for me it is the essence of Paris. The market is a hotch potch of sheds and buildings extending in all directions. In Woody Allen’s recent film ‘Midnight in Paris’ Owen Wilson spends quite a bit of time strolling through the lanes and avenues of the flea market. The market stalls vary from smart, glass units with air conditioning to simple little ‘lock ups’. The range of goods is quite amazing. You can buy crockery and glassware, silver cutlery, oil paintings, vintage luggage, antique furniture and even old tennis racquets and wooden sledges. One lady sells oak tressle tables, the type that Snow White and the Seven Dwarves might have used. An old man sells spiral staircases. Really, he just sells spiral staircases, reclaimed from old buildings all over France. They can be wooden, steel, wrought iron or a mixture. One day I’m going to buy one and install it in my house on the river. One day. Other traders sell architectural heritage items, old street lamps, oak doors, metal door handles, street signs, window frames. I love to think of the story of these items, where a window frame began it’s life, what sort of house it was in, who looked out of it. The ‘Marche aux Puces’ is a dreamers’ paradise. There’s one chap who sells zinc bars – the sort of bar that used to be in every cafe in the country. Another sells vinyl records from the 40s. One stall stocks thousands, literally thousands of tiny metal cars from the 20s. My favourite stall is owned by a French man and his English wife, they sell vintage luggage and handbags. The perfect place to pick up a 19th century Louis Vuitton trunk or a 60s vintage Hermes scarf or even an iconic Hermes hand-bag. I recently popped in to say hello and ended up buying two vintage Hermes scarves. One scarf depicts scenes from the Bayeux Tapestry. I remember learning about that in school. It is shades of green, gold and turquoise. The other is based on a design of Persepolis the ancient Persian city. It is peacock blue, celestial blue and rich brown shades. Many of the traders have been based here for years. At about mid-day they all have lunch. In real French fashion out comes the table cloth, food, bottle of wine and the stall holders sit down with their neighbours and enjoy a convivial lunch. You can disturb them from their ‘repas’ with a question, if you dare, I would advise against it. In fact it makes more sense to head for one of the local restaurants and enjoy a soupe a l’oignon and a glass of Bordeaux. The market is open every Saturday, Sunday, Monday. I strongly recommend a visit.